Town of Innisfil (Lower Tier Simcoe)Record Owner? Log in. The area was surveyed in 1820 and the township was named from Innisfail, the poetical name for Ireland. 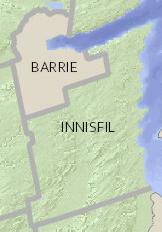 Have something to say about Town of Innisfil (Lower Tier Simcoe)?